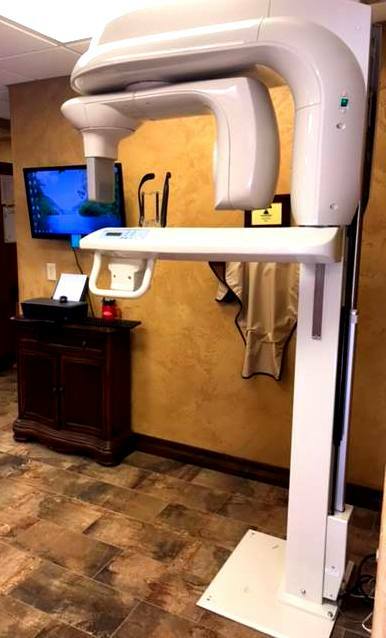 Endodontics of the Ozarks utilizes a Kodak 9000 Cone Beam Computed Tomography (CBCT) machine. This is a medical imaging technique that produces 3D color images of your teeth, jaw bone, and structures within the jaw with incredible detail. It enables us to perform a wider range of diagnoses and treatments in our office, helping to reduce multiple visits and in many cases can eliminate the need for exploratory surgery. Analyze the position and orientation of critical structures, like nerves, vessels, teeth roots, previous implants, the sinus and nose. A CBCT is a compact, faster and safer version of the regular CT. Through the use of a cone shaped X-Ray beam, the size of the scanner, radiation dosage and time needed for scanning are all dramatically reduced. The time needed for a full scan is typically under one minute and the radiation dosage is up to a hundred times less than that of a regular CT scanner. The Kodak 9000 offers the highest resolution and the lowest radiation dose.